I ride across the Snake up Reynolds Creek to explore roads and routes I’ve not seen before camping somewhere in the mountains behind Silver City. “All systems nominal” the KTM would say in a soothing, female voice if only it had the speech synthesis of the fictional Comanche helicopter I used to fly.¹ I’ve had an extra couple weeks to isolate rattles, make adjustments and tweak the BlueTooth, WiFi and GPS gadgetry for roughing-it in the Owyhees. Things were different a few weeks ago. Hunter and I were rendezvousing with three guys we’d not met before, Eric, David and Henry, to camp at Indian Hot Springs.¹ But just a mile down the trail, in spite of running Tubliss,² I had a flat our combined resources could not resolve. Five hours of driving for five minutes of riding was a bit disappointing. It was there in the forge of the flat fix endeavor that a plan to ride to Three Forks¹ formed (I believe David’s idea). Waiting at home for replacement tube and tire made time for route analyses. We weren’t able to make our May schedules mesh again so I decided to use the Three Forks research for a weekday solo run through the vast and empty Owyhees along roads I’d not seen before — adventure! Although today desolate, the area is steeped in pioneer history. “There was a large immigration in 1862, owing to the civil war and to the fame of the Salmon River mines,”¹ a stick and carrot moving people east-to-west. Reynolds Creek, at the start of my ride, was one of many Owyhee settlements formed around the ephemeral pursuit of mineral wealth. The expedition found no hidden treasures but prospecting turned up enough color to draw the hopeful to settle Reynolds Creek. Among them was John Magnus Brunzell who immigrated from Sweden and came to Reynolds Creek around 1868. He owned a saloon, ran a lodging house¹ and helped “to build a school house 22×36 ft. for the sum of $870” in 1886,¹ the dilapidated building I’m looking at now. Mail service to Reynolds is said to have ended about 1940.¹ The school has probably sat decaying since then, slowly bowing to the sagebrush prairie. I am buffeted by a flurry of swallows as I approach the school door. I think for a moment they’re bats when I see them emerging from basement stairs but then I recognize the scolding arcs cut through the air around me. I decide to alarm the school’s residents no further and content myself peering through perimeter windows, imagining neat rows of students, brothers and sisters, side-long glances. I enjoy the opportunity to visit with ghost town dead. They rest here, across from the school, as they do in so many other Owyhee plots — sun-bleached amidst brown tones, too young, we would say, to have gone. Following John Barenberg’s advice, I leave Reynold’s Creek and turn up Whiskey Mountain to continue upland. John’s Google Earth images were a major part of my route planning. I’m grateful for his guidance. Morning rain has made for tractable, dust-free passage between small meadows popping with flowers. If there’s an adventure riding heaven, it couldn’t differ much from this. Down the hill from Whiskey Mountain near Succor Creek, I stop a moment to look at Bergh Mine. The small tunnel would hardly be noticeable apart from the surrounding diggings. I come across a Monarca Mine bunkhouse not far up the hill from Bergh. Monarca was a lead and silver mine in the 1960s.¹ I see only refuse through open doorways so I continue on my happy way. Because I grew up among North Idaho evergreens, I think, aspen groves always seem special, always worth a stop and look at their white bark and winking leaves. Up here, that means a lot of stops. One of the few things I remember from three-years-old is lying on the floor of my Grandma and Grandpa Reed’s living room in Troy, Idaho, driving my Matchbox cars (which I still have) back and forth on the floor. I watched the little wheels turn round and round through small hills and valleys in the carpet. There was something fascinating about it. I have the same feeling today about curls of white bark, bubbles in a tiny brook, sage wafting in the breeze — so many wonderful details for my three-year-old self to enjoy. I looked into Parducci’s analyses and found them more than I could digest in short order but it makes sense that having the mindset to find joy in ordinary experiences is the happier condition than pinning hopes to future glories. Riding has helped me cultivate present, ordinary-moment appreciation, I think. Snow visible in mountain lees was long a clue the road might somewhere be buried. I first spin through ice in forest shadows near 7,000 feet. Others have cut trail so it isn’t bad. Above the trees I’ve little choice but to circumvent deeper snowbanks on over-saturated ground. I try not to spin. Southern slopes are snow free and carpeted green with spring grass. I stop for a celebratory look around, admiring the delicate flowers that cling to this thin, windswept soil. The small placemark escaped my notice while route planning so I’m surprised to see a cemetery along the road as I near the base of mountain hills. I pull in to visit the people here. One Tom Walls ran a Wagontown horse track that was known far and wide for several years.² These descriptions make me think of Star Ranch,³ well north of here, near Placerville, which also sported well-attended horse races and dances in the late 1800s. The lifespan of Wagontown was similar to that of Reynolds. Its remnants were erased, converted to gravel piles, when the valley was dredged in the 1930s.¹ The cemetery on the hill is all that remains. Raindrops spatter against my face shield as I fly along the wide gravel of Long Ridge after leaving Wagontown. Dark sheets of rain hang over South Mountain, ahead. I turn from the gravel to a twisting four-wheel-drive track above Jordan Creek but keep my speed. Until I see a pretty flower. I suppose it catches my attention for having the audacity to grow in the middle of the road, the delicate petals belying the large, bitter taproot that was part of the Native American diet. I saw a Google Earth image of Jordan Creek in a slot canyon that inspired me to come this way for a look. I pull open yet another stretched wire gate and begin descending the rocky, little used trail toward the creek. I am rewarded with the expected scene, small creek threaded between tall cliffs lit orange in the afternoon sun. It’s beautiful. I expect to continue along the creek some ways to the main road but the trail turns to brush and I realize it must continue on the other side of the water. I look closely at the high running creek. “I can probably go off this tall bank with some speed and clear the deep part,” I think. Then I think again and start backtracking out of the canyon. The alternative route is beautiful in its own right, a gradual red dirt descent by blooming bitterbrush toward South Mountain. I reach Flint Creek Road in a lush meadow where Big Boulder, Rail, Old Man, Duck and Flint Creeks come together with Jordan Creek. That’s a lot of creeks! Speeds are high again on the gravel of Flint Creek Road. I fly through meadows and over sagebrush hills. I thought I might pop over to the Boulder Creek gorge south of here, or down Antelope Ridge a ways, but the rain delayed start to the day and many other stops mean I should focus on finding somewhere to camp. I ride on. I laid in a route that would lead back into the mountains around Silver City for camping but I’m quickly thwarted by a fence and “private property” sign. I guess I’m going off-plan. I could stop and camp most anywhere (I haven’t seen anyone on my path for the last five hours) but for coming all this way, I’m aiming for something spectacular. 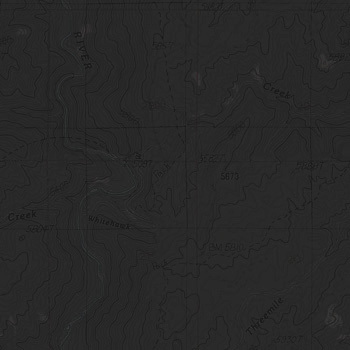 I follow a dashed line on the GPS farther and farther, across Bridge Creek to the ridge above, one BLM gate and another. “Is this spot nice enough” I ask myself. “Nope.” I keep going. When the trail ends and light wanes, I decide it’s time to decide. I think I’ll at least find a place well away from many sand mounds that have the appearance of large insect homes. I don’t need that kind of wake-up. There is just enough daylight left to set up and relax a while by the fire. My childhood bedroom faced tall pines and I find pleasant memories in the sound of wind through their boughs but tonight it is also lonely. I wish Jessica and the kids could be here. I like riding alone more than camping alone. I am lucky to have found a site with a kitchenette (rocks) and coat room (stiff branches). I eat spicy noodles and sip whisky while the tiny pump works on my air mattress. The day and dinner drinks have made me tired. I am excited for the sites I plan to see tomorrow but sleep sounds best now. Good night.